We Live for the Challenge! I think it’s safe to say that when the swimming pool was constructed nobody ever imagined the possibility that the swimming pool would ever be demolished and filled in. I’ve seen pools crammed into the smallest of backyards and I have thought “dang, someone really wanted a pool”. Often times I wonder “how did they get this pool in back here”, and I usually presume the pool was built prior to a house going in on the adjoining property. Additionally, it’s not uncommon for there to be 20, 30, 40 years of “life” situated around a swimming pool! And by that I mean trees, sheds, landscapes, patios, walls, clothes lines, burial plots for family pets, trees planted in memory of loved ones, fencing, koi ponds, overhead utility lines, etc. Long time owners of the property usually want us to be as careful as possible to not disturb what surrounds the swimming pool. While newer owners of the property are usually open to permanently removing anything in or near the access and work areas. Yes, we do use “compact” equipment to demolish in ground swimming pools, that’s par for the course. However, “compact” does not mean the equipment is not going to leave a foot print! There are limits as to how compact we can go with the equipment and still effectively accomplish the task at hand in a reasonable amount of time. We always perform our jobs with respect to your property, as well as respect to the adjoining property. But the reality is there are many properties out there that have constricting yard space, no area to stage fill material, and challenging access. 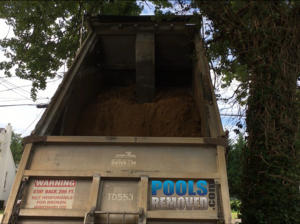 As a professional pool removal contractor our goal is for our client’s experience to be as stress free as possible in all aspects of the job. Our experience and wisdom makes all the difference in how a property with challenging logistics is handled. However, no two jobs are the same and there may be limits with what we can do. We ask our clients who have constricting properties and difficult access to please keep an open mind. Remember, the swimming pool was initially installed without the notion that one day the pool will be removed and filled in. It seldom happens but you may have to make some sacrifices in order to have the pool properly demolished and filled in; a tree may have to come down, a retaining wall or steps may have to come out, the outside A/C unit may need disconnected and moved, we may need to use a portion of an adjoining property. 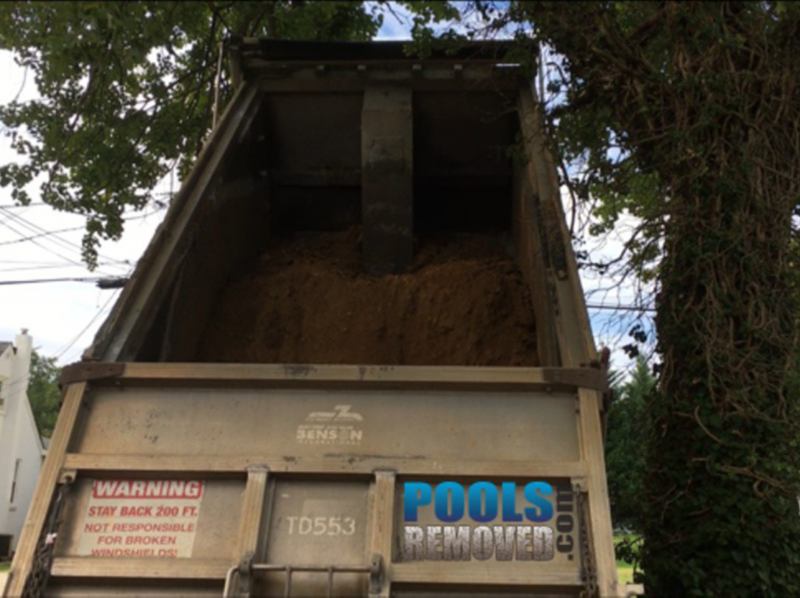 I recently came across a pool removal job in Chevy Chase, Maryland. There was plenty of clearance for a skid steer loader to access the backyard. The issue was that the loader would have to run very close to the foundation of the house. 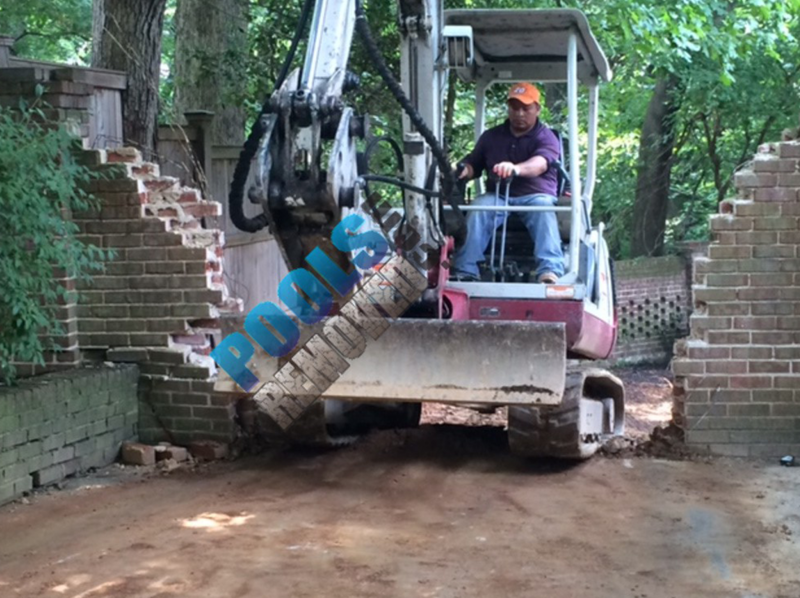 Due to the heavy weight of the compact machine, this activity will put a block foundation wall in jeopardy of being damaged, damage that may not be detected for months or years later, as most houses have finished basements and you can’t see the foundation walls. 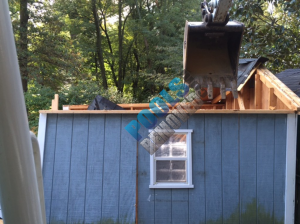 I had to be the bearer of bad news, I had to recommend to the owner that they have a fairly large evergreen tree taken down by a tree removal company so that skid loader could access the backyard without having to come so close to the foundation wall of the house. What’s more important, the structural integrity of a dwelling’s foundation, or a tree – a tree that sooner or later will need to be removed anyway? 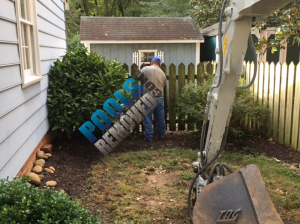 We try to avoid it, but there are times where we must traverse on a small portion of an adjoining property to access the backyard of our pool removal jobs. We will only use adjoining property to access our jobs with written and signed permission from the owners of the adjoining property, we have an agreement that we provide which must be signed by all parties (contractor, clients, and adjoining land owners). If you have a restrictive, confining property, and you’re thinking about demolition of your swimming pool, now is the time to start being friendly with your neighbors! 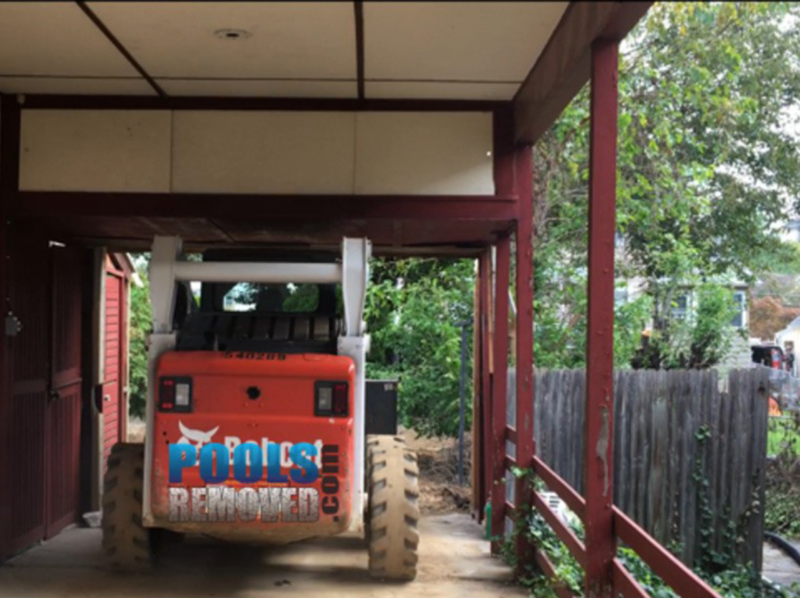 At another recent pool demo job in Falls Church VA, there was only one way into the backyard to access the swimming pool. And there was an old shed sitting right in the path needed. 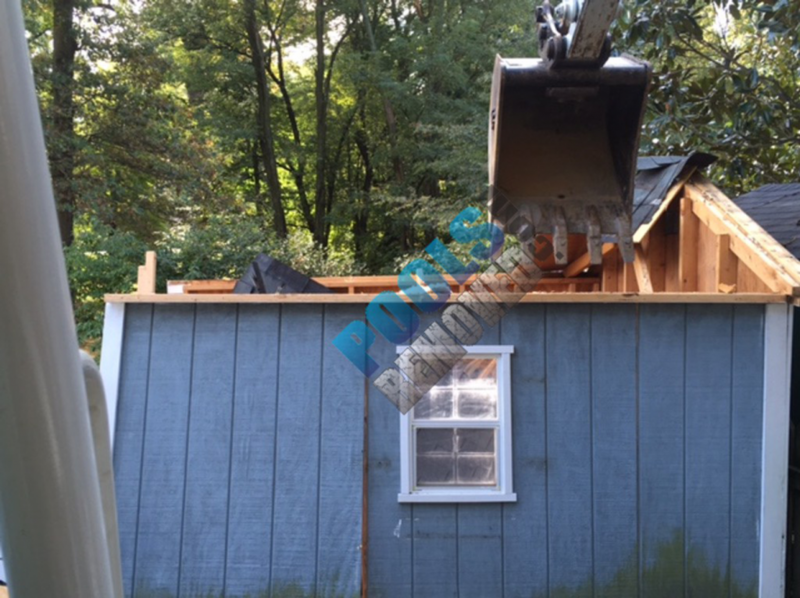 The owner was aware that the shed would pose a problem before he contacted us for a quote to remove his swimming pool. The shed was old and the bottom was rotting, so we permanently tore it down. Not too long ago in Baltimore County Maryland we removed a vinyl lined swimming pool that another contractor started. The owner wasn’t happy with how things were progressing and told the other contractor to stop the work and not return. Both the left and right side yards were very narrow and had structural obstacles in the paths into the backyard. The adjoining property owner did not want anyone using his property to access the pool. That left us with only one way into the backyard, through the carport, and the carport had a very low ceiling, and the back wall of the carport had to be permanently removed. Since the pool was being removed the back wall wasn’t needed anymore as it existed because of the pool’s existence. Often times, prospective clients will say to me “we don’t want the soil dumped in the driveway, dump it in the street”. However, most counties and local municipalities do not take too kindly to soil being dumped on the street and there can be a stop work order issued accompanied by hefty fines. 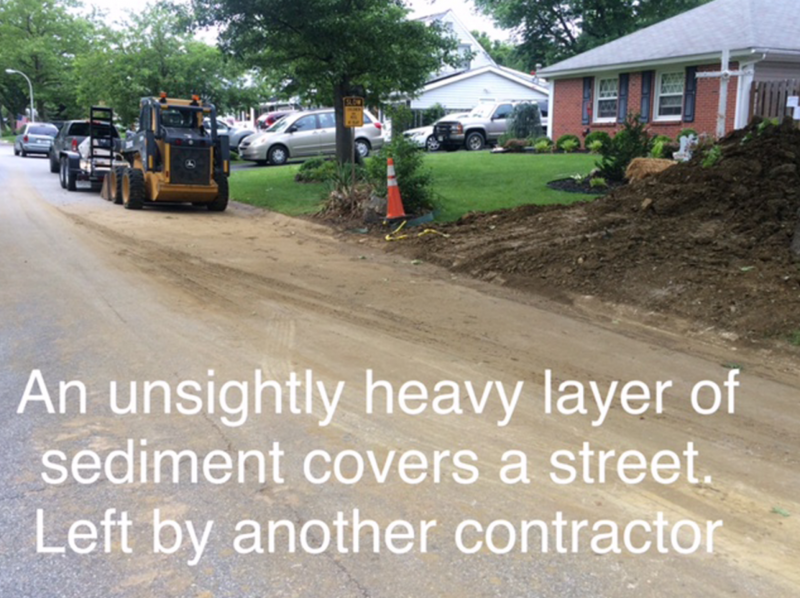 If there is absolutely no other place to safely dump and stage fill soil, the county or local municipality will usually work with us, provided no soil, no sediment, is left on the street at the end of the work day. Its not about doing the work in record time. It’s not about closing a deal, Its about starting relationships. We have experience in concrete, gunite, fiberglass, vinyl liner, and spa demos, as well as the removal of tennis and sport courts. Get twelve months use out of your yard as you want it. How Many Gallons of Water Does the Pool Hold? 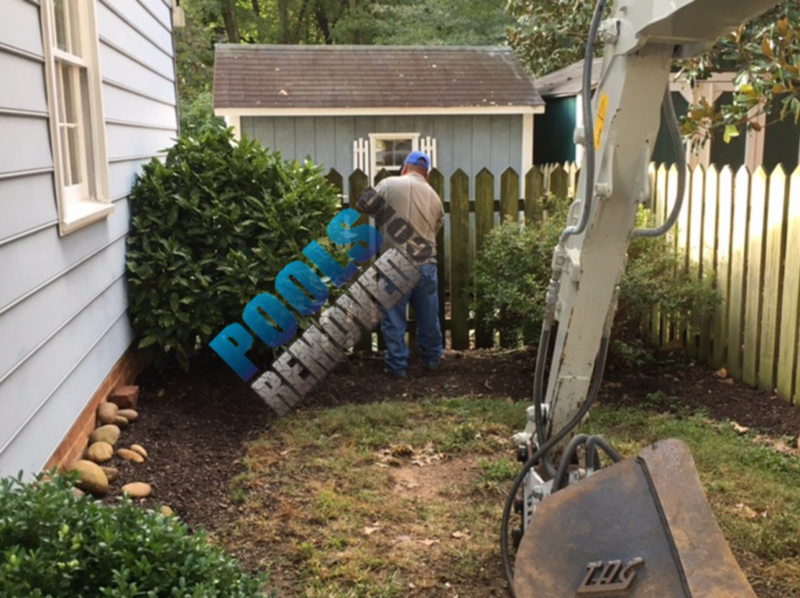 Do you have a shed, fence or retaining wall that you would like removed while we are there?